Heavy with political experience, the Action slate dashed back and forth between the Hall and LB buildings, holding posters and sporting matching blue t-shirts during the opening hours of the Concordia Student Union electoral campaign this morning. Running two CSU councillors, two Arts and Science Federation of Associations executives and a Concordia senator on its executive, Action represents the political status quo at the university. 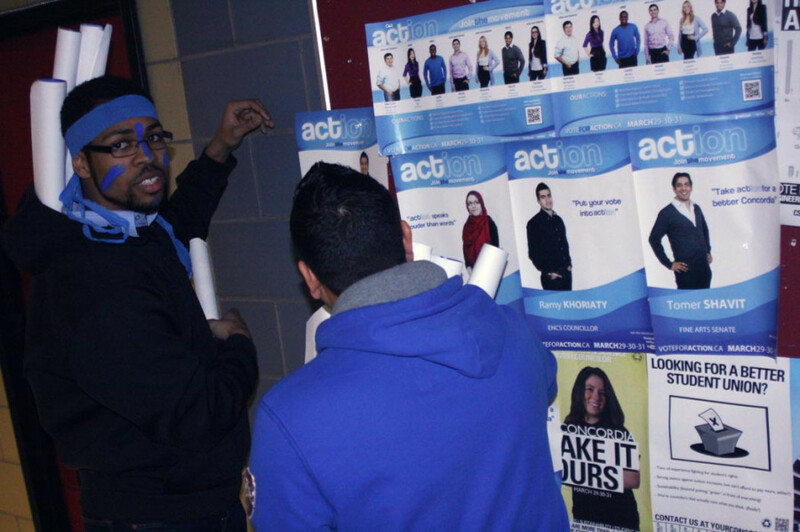 From start to finish, Action team members showed their organizational experience, wasting no time in seizing as much poster space as was available. Current members of the CSU’s executive also shadowed the group. There were many times where the Action team stood at the foot of the escalators, with VP Clubs & Promotions candidate Leslie Reifer chanting the name of his slate. Aaron Green is a current CSU councillor and president of ASFA. He is running for election as councillor and as president of the Political Science Students Association. Tomer Shavit, another current CSU councillor, is running for Senate on the politically seasoned slate. In the weeks leading up to poster night, Shavit actively campaigned against Your Concordia’s Morgan Pudwell on Facebook and The Link’s message boards. A number of candidates from Your Concordia’s camp defended Pudwell, in what could be construed as pre-campaigning by both parties. Shavit also acknowledged inviting several people to a secret Facebook group that called for the resignation of The Link’s Editor-in-Chief Justin Giovannetti. “I didn’t hide from the fact that there’s stuff going on at The Link that I don’t approve of, and I felt there was nothing wrong with inviting five or six friends,” he said. The Facebook page for a group called “Free The Link” shows Shavit to have invited 16 people. Though bickering over the positioning of posters was not uncommon, the only major potential campaign violation was by Action CSU councillor candidate Ari Dabora. Dabora was photographed at a protest last week in front of The Link’s office, which could be considered early campaigning, as the protest attacked the character of Your Concordia presidential candidate Lex Gill.